Where Can I Get Makeup Training? So, because we want to make you happy and achieve all of your dreams, we wrote this post :). 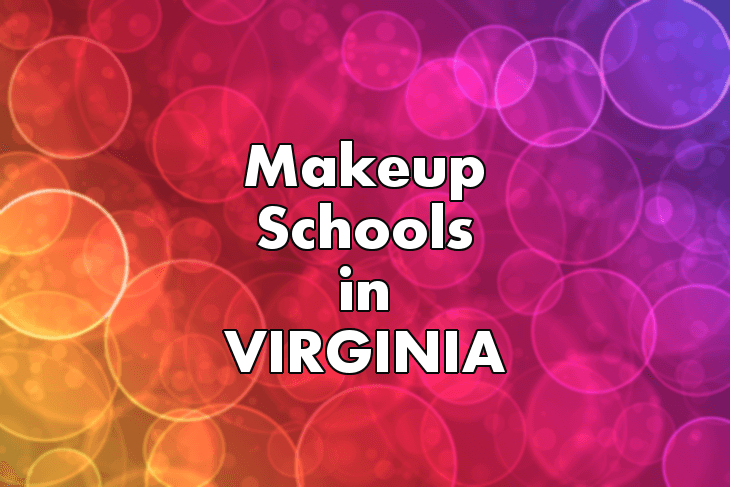 In it, we go over the various types of making training you can receive, talk about whether you'll need to apply for a makeup license, and list all of the makeup artist schools in Virginia that you can apply to. How to find clients and build a small business. The programs are a little pricey, but they can be an INCREDIBLE start to a makeup career. Remember how we said that makeup schools go into great detail about the subject of makeup? Cosmetology colleges do the exact opposite: instead of introducing you to one aspect of beauty, they introduce many aspects (skin, hair, nails, makeup, and safety procedures). It's a great way to get learn the basics of every important aspect of the beauty business, and have the basic skills to enter a variety of different jobs in the industry. Graduates of a cosmetology program can apply for a Virginia state cosmetology license, and work in a beauty salon or day spa. That's not the case for people who graduate from a makeup artistry school--graduates of those programs are only allowed to become freelance makeup artists (we'll explain more on that in one of the following sections). Having a degree from cosmetology school can help you have a "competitive edge" when you're in business and looking for work. If people see that you can do hair and makeup, and another job candidate can only do makeup, you'll look like the better candidate. Ease of Access. Cosmetology schools are located in every city in every state; makeup artistry schools are a little harder to come by. Time Required: Anywhere from a single one-hour class to a two-week "intensive"
Who Should Go? Everyone! These classes are great for hobbyists and people who want a career doing makeup. These are a "lower commitment" option if you want to learn about makeup. Makeup artists will set up a one-time makeup class in a beauty salon, hotel conference room, convention center, community college, or studio, and teach lessons to people who have signed up and paid the entrance fee. Participation is usually on a "first-come, first-serve" basis, so if you find a class, be sure to sign up early. You can find upcoming classes on sites like EventBrite, Meetup.com, Yelp.com, GigSalad, and Craigslist (sometimes). These shows usually take place in larger cities, and luckily, Virginia is home to a number of big cosmopolitan centers with high populations: there's Norfolk, Virginia Beach, Chesapeake, Newport News, Richmond, Roanoke, and Portsmouth. Take a look on the sites above to learn about courses you're interested in. Who Should Go? Everyone! Another great way for career starters and fashion-lovers to get instruction. This can be a VERY fun option--especially if you bring friends. Instead of waiting for a workshop to pop up, contact a makeup artist directly, and ask about personal coaching. Many makeup artists already offer private classes (it's a great way for them to bring in some extra money), so see if they've already got a schedule of classes. If not, you can negotiate a per-session rate, and you can ask them to teach you *exactly* what you want to learn (which is pretty fantastic). If you want to do makeup--or be paid to provide any kind of beauty services--in a Virginia beauty salon or spa, you'll need a license. Most people either get a cosmetology license (if they want to do skin, hair, and nails) or an esthetician license (if they want to focus on skin care). The laws of Virginia are very clear about that. We checked on the website for the Virginia Board for Barbers and Cosmetology, and we could not find any laws or statutes that mention a makeup artistry license. And, we know of many freelance makeup artists who do not have any kind of license. At present, the state of Virginia seems to be "looking the other way" when it comes to freelance makeup artists who work independently of salons and spas, but that may eventually change, and the state may eventually write laws requiring freelance makeup artists to get a license (or simply start paying a lot more attention to people who practice without a beauty license). If you have questions, we'd recommend calling the Virginia Board of Barbers and Cosmetology at (804) 367-8509. They are in charge of making sure that beauty professionals in the state of Virginia comply with the laws made by the state, so they can help you with any individual questions you may have. Keep in mind, many makeup professionals get their start at a makeup school, but there are just as many–probably many more–who go to a beauty school. If that’s a career path you’d like to take, here are a few schools where you can get your start. As always, we wish you all the best!